Traditional boats race on Han River. DA NANG (VNS) — The teams of Hoa Hiep Bac and Hai Chau won the men's and women's titles, respectively, at the Traditional Boat Race on the Han River on Wednesday. 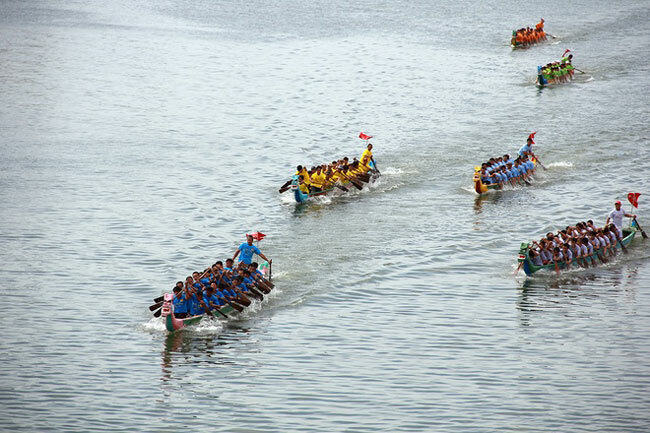 The annual race, which celebrated the 70th anniversary of National Day, drew more than 250 paddlers from 12 teams in Da Nang and Quang Nam, competing in the men's 7.5km and the women's 5km events. Members of the city's water sports club also demonstrated their skills in water-skiing, jet-skiing and surfing on Wednesday.